Most people in this age and time without any vehicle of their own are sure indebted to the inventor of this wonderful vehicle which is the heart-beat of the transportation in India without which the “aunties”who dont know how to drive and poor people like us who dont ave a vehicle would have been crippled and would have had no means to commute. And I thank the autowallahs for this and generally my journey in an auto is fine unless more than 7-8 of us are not sitting in the auto. All seems fine and well until the guy decides to turn on the instrument in his auto which kinda resembles a music system. First of all the quality of sound emanating from the device seems as if it is not playing at the moment but instead a recording from one cassette to other cassette is being done on the stereo. You will know if you have ever heard some thing being recorded, lagta hai ki singer ka gala baithne ki jagah let gaya hai par uske bad bhi pet palne ke liye gana pad raha hai..
Aur sone pe suhaga to tab hota hai when you start listening to the music… I have been travelling in autos for umpteen years now but somehow can’t understand how come all the autowallahs have similar music taste. You sit in any auto and you are sure to find Kumar Sanu singing from some 90s song which could barely see the face of cinema hall and would have got down after the first week or may be even before that and one more common qulaity of these songs in that they are all “Dard bhare nagme” where the hero is always lamenting about the loss of the love of his life coz of “zaalim jamana” or “taqdir ke sitam” or she has found someone else in life.. Some time back all the autowallahs were bitten by the Himesh Nasalamiya and Kumar Sanu seemed to have lost into oblivion but as no new albums of his have been released recently (to the best of my knowledge as if I care a damn!!). Those people have generally reverted to Kumar Sanu and his brand of sad songs from 90s. This makes me think that there are some singers in India who have prospered just because of a particular kind of music and listeners base, Kumar Sanu and to a large extent, Himesh Nasalammiya,sure should be indebted to the autowallahs to be able to progress from being driven in an auto to being an able to drive and own luxurious cars. Another such example is “Anuradha Paudwal“, i can’t remember even one song which she has sung in any Hindi movie and the only time I can remember her is on a Gulshan Kumar album praising the lord. She seemed to have been made just for singing devotional and nothing else. PS3:- Most high profile sporting encounter in IIIT history was organised peacefully, thinking of writing sumthing on it. PS5:- Will sure write about it. PS7:- Adam Gilchrist retires… 😦 He is one Australian player who always played hard but fair.. Will miss your batting Gilly!!! PS11:- Crossed 10 PSes which means I have a lot BC to do..
PS12:- Have my first BTP viva day after tom or tom(whatevr u say.. Its past 12).. 30th i mean!! PS13:- Old is Gold without any doubt,I just love 60s and 70s music be it Hindi or English!!! PS14:- Right now listening to the ethereal voice of Rafi!!! I have been listening to the songs of Jodha Akbar since two days and I think A.R.Rehman has once again churned out a winner from his kitty. I think this album might not reach top of the charts coz it doesnt have the popular music Dard-e-Discos type but you can’t except such type of music from a period movie and also from A.R.Rehman. Rehman’s music has a very different sound which though is different but always pleasing to ears. Azeem-O-Shaan – The song looks like a war cry, seems very good while listening without any background and continuation, I think the song will sound awesome in the movie coz it is the type of song which requires a stroy building behid it. Jashn-e-Bahara – A melodious song sung in the ethereal voice of Javed Ali, a winner hands on. Along with Azeem-o-shaan the most popular song as of yet. In Lamhon Ke Daaman mein – “Romance”, the first word that comes to my mind on hearing the song. Once again Sonu Nigam’s soothing voice turns it into a very good song and Madhushree also supports him well. Koi kalma mohabbat ka dohrate farishte hain. Khamoshi mein Pukar – Only song completely in the voice of female and the singer of the song, whom I am eager to know the name but couldn’t find anywhere. Some times her voice sounds like the soft sound of Shreya Ghoshal but then she develops an intensity which i have never heard in her songs so I am confused, hope someone can help me. Well btw coming to the song, it is another wonderful combination of music,lyrics and singing. Mann Mohana – A song which not many people will like but which I liked very much and I was rebuked by people on telling that I liked the song which according to others is the worst song in the album. The song takes you to the same place and setting where Mirabai must be crooning her devotional songs for Lord Krishna and you can imagine her sitting in front of you with her sitar. With all those references to Brindavan and terms such as ‘Raas-rachaiya’ and ‘Kanha’, this songs conveys its feeling completely and cheers for the singer Bela Shende for singing it so beautifully. Khwaja mere Khwaja – In every album of his, Rehman sings atleast one song and that song generally is my favourite in the album from Dil Se in Dil Se, Banjar from Saathiya, Ye jo Des Hai Tera from Swades, Aazadi from Bose,the forgotten Hero, Roobaroo n Luka Chhipi from RDB,Jaage Hain from Guru.. the list just goes on and on. But somehow this song doesnt live up to the billing of the best song of the album, though I have got the feeling that this song will eventually grow up on me but even then it wont become the best. Will say the least good song of the movie. Won’t term it as bad though. I got to know that “Khamoshi mein Pukar” is not from Jodhaa Akbar. I am very sorry about this.. Actually somebody downloaded the songs from net and this song was in the folder. PS1:- BTP report submission on 26th n Viva on 30th.. and have done nothing as of yet..
PS3:- Ganguly n Dravid dropped from the squad, am just afraid that someday they might even drop Sachin if he fails in a series and that would put an end to my watching cricket for some time atleast but that would for sure ignite nation wide protests as they are going on in Kolkata for Ganguly. PS4:- Without any shade of doubt A.R.Rehman is the best music director and Javed Akhtar, best lyricist in bollywood. PS5:- Lets hope the film leaves up to the pre release hype. Yesterday our Dear Prime Minister Dr. Manmohan Singh gave a statement “India, China can dislodge West” that statement sure has a very good intent, that of trying to get India to the top of ladder of economic development and making India a super power. In the last few years every news paper has been abuzz with the stories of rising India and India becoming a super power by 2020 or 2030, stories of India surpassing every country but China and India-China on the helm of economic issues on the world. China sure has taken many steps in this direction but India though in a much better position now than say at the turn of the century is still a long way from being a world super power or even being on the way to becoming a super power, while China most surely is sprinting on the road to success. China is superior in every thing except for one thing that we Indians are much better English speakers which is the universal language and thats a factor why even though China can become the super power which it is destined to be but China can not influence the world as much as UK did in the last century and US did in the 20th century but as far as I have read they are taking massive steps in this direction and will sure try their best and the way they do things, I am pretty sure that they will succeed in their attempts. 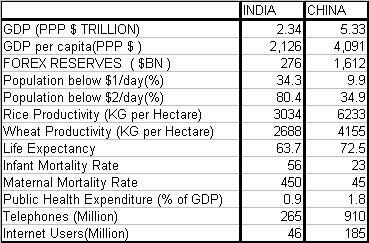 I think the Indians should stop comparing the Dragon with the Elephant because China is a lot ahead of India and the main thing is both the countries have different sets of problems and the solutions and approach both should be completely different. PS1:- In no mood to write PSes.. In a hurry!!! I remember when I was a 13-14 year old teenager, my mom used to tell me that when they were of our age they were very ignorant of the world and the knowledge they had of the outside world was cipher when compared to what we knew. These days when I see my young cousins of the same age group, I can say for sure that they are light years ahead of us when we were the same age. The average children these days are technically far superior than their counterparts just 5-6 years ago. The difference in intelect between us and our parents created by a difference of almost 25 years is replicated between us and those children. It seems as though the age difference between generations is on a decline. On our part, most of us got to have their mobiles for the first time when we came to the college for thr first time but children these days get mobiles while still in school which is a sort of necessity these days for them. With all the orkutting and chatting they seem to be leaving us behind in terms of the online presence they have. By the generation gap, I don’t mean the term in conventional terms as it is generally used. It is generally supposed to mean the ideological difference between two set of people, I don’t think that there might be ideological differences as such between us people but sure they are a lot more advanced than us in their age. A classic example in this case is, when we guys came to the college the maximum knowledge of english songs was limited to BSB and some songs like Words and My Heart will go on with a select few having the rare distinction of having heard music of bands like Linkin Park and all but now in our college you see a guy in his first year wearing a Pantera t-shirt almost from the time he came to college and quite a few rappers we have got in the first year, these things surely tell a story of their own. Just hope that the differences aren’t too much and we are not labeled as old ones if not by these guys then by the children who are in their kindergartens now!! PS3:- With all my friends in north complaing about the cold there, can’t help but bless the weather Gods of Hyderabad. Recently i have been watching a lot of movies.. So I set out to write about the 5 latest movies I have seen in the order in which I saw them. 1. An affair to remember : Seriously a movie to remember, I have always loved these old romantic movies, somehow the type of elegant romance shown in these movies attracts me more than the modern breed of movies. The emotional part of the movies is shown brilliantly. A lady and a gentleman meet on a cruise and fall in love and promise to meet in six months at the top of Empire State but can’t. 2. Bringing Up Baby : Another Cary Grant masterpiece,a screwball comedy with combined with the genius of the great man. A laugh riot on the whole. You can’t help but sympathizing with the the poor “Zoo-logist” as the actress Katharine Hepburn refers to him, while just falling in love with the naive and rich Susan Vance the lady of the movie. At times you just burst into spasms of laughter unable to control yourself. All in all a must watch… Provided you dont have apathy towards Black and White movies. The story isn’t much to tell except a Geologist keeps running into the beautiful young and rich young lady who proves to be nemesis for him but the thing to lookout for in the movie is their chemistry and comic timing. 3. 3 Deewarein : A Nagesh Kukunoor special, its quite rare to see such type of movies being made in India and it gladdens the heart to see such movies and such directors existing in India. The story of 3 murder convicts, their life in jail and a lady journalist who interacts with them. The movie is good but the twist in the tail end gives the movie a different feel altogether. 4. Before Sunrise : “Poetry in the form of a movie”, this is how I would like to describe the beautiful movie. I have oft heard that this is a very romantic movie but romance aside, I was just blown away by the beauty of the talks they have between themselves. The story of how two complete stranger meet on a train and fall in love but the only thing they dont have is time, which is the only thing in short supply in their otherwise rich romance.Sure you have two poems being thrown with all the dialogues to further beautify the screenplay but the main strength of the movie is the conversation they have, intellectual at times, romantic at others but all just expression of beauty coming from their mouths. PS3:- I dunno but somehow after writing so many poems in a spurt, somehow I just can’t write anything poetic now.. 😦 Somebdy help me. Recently I have been flummoxed by a recurring thought about the origin of the Natural Languages which we read and write these days. I cant think of the way that these languages might have developed in the very starting. How would be the people who invented these langugaes would have had laid the ground rules of the language in the initial phase of languagae development. I can understand that most of the languages prevalant these days have developed from other languages but there must have been some time when the transition from sign language and animal like cries must have come about, I dont say that this must have happened in a single day or a short duration but there must have been some guidelines according to hich the laguages must have developed. Another thing which puzzled me is the naming of the language, who would have named the language and in what language would they have named the language, would it have been their own language or a pre-existing one. PS1:- Happpy NEW Year Blog Readers..
PS2:- A post after long time and that too arbit. PS4:- New Year in Goa… Rockinggg!!! PS5:- Had a lot of things to blog about the issues like New Year,Sydney Crkt Match and Goa trip became old and coudnt post due to my lethargy and fever.